The Newton Family Singers (NFS) is an intergenerational family chorus that brings together families and friends of all ages to sing American folk music in the Greater Boston area. Our mission is to create community through music. Singers, young and old, are nurtured to sing, create and perform while learning from each other and building family and community bonds. 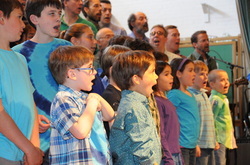 The Newton Family Singers rehearse at the Waban Library Center, a library and community space dedicated to intellectual, cultural, and social enrichment in the heart of Newton, MA. Although not explicitly part of Newton Family Singers' mission, we've found it rewarding to raise funds for nonprofits that have touched members of our community. When concert ticket sales benefit a charity that's important to us, it's easy to ask people for their support. These are some of the charitable organizations that NFS has supported over the years. In all, over $15,000 have been donated to these groups. Fleetwood Mac and Tom Petty! Our upcoming concert will feature the music of Fleetwood Mac and Tom Petty!